DENVER, Colo., Aug. 10, 2011 (SEND2PRESS NEWSWIRE) — With the many ups and downs in the economy lately, it seems unusual to hear about a new business emerging strong – yet in Denver, Colorado, the timing seems to be just right for Jiggy’s Pipes. With the emergence of the Medical Marijuana Dispensary rush that has been going on for some time now in Colorado, the focus in the news has been the legal, tax, and other ramifications this new industry would bring. But what about the other businesses that also benefit from the rush; since the MMJ industry has exploded, several other products are also in demand as a result. This was the thought for Mark Jiggy, owner of Jiggy’s Pipes. 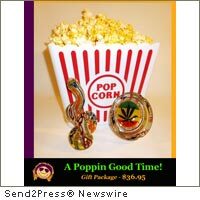 By recognizing the pending demand for the pipes, hookahs, bongs, and “zongs,” he has created a new online cottage business that provides a valuable service to the patrons of the dispensaries – an online catalog of specialty glassware, created here in the Colorado area by some of its artisan glassblowers. Truly unique items such as Gandalfs, a very long glass pipe modeled after the famous Lord of the Rings smoker, and Zongs (highly intricate twisted, tall bongs), can be found at Jiggy’s Online store (www.jiggyspipes.com), along with some truly funny gift pack combinations – such as “A Poppin Good Time” which bundles a popcorn tub, three packages of popcorn, a collectible ashtray, and a Glassware Bubbler. This, and the “Breakfast O’ Champs!” containing PopTarts, a lighter, and a small Glassware Bubbler were inspired by the Midnight Munchies stereotype typically associated with the dispensary audience. The concept was simple – a business that does NOT provide marijuana or any similar substance, but does provide glassware, lighters, and accessories to support the dispensary industry. The feedback so far has been very enthusiastic – while Jiggy’s is purely an online store and is very new, Mark has stated that the interest and demand is very high. In fact, when he originally thought about setting up his storefront, he did not anticipate the response to some of the glassware – not only is the product popular, but some of the glassblowers in the area are creating some very unusual and intricate designs, are very happy for the new work, and look for him to visit every week with his inventory needs. 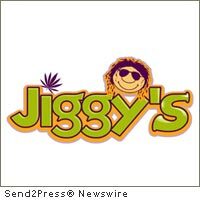 Jiggy’s Pipes (www.jiggyspipes.com) is a new business that has come from the changing world of legalized medical marijuana. Like any other business, it strives to provide its customer’s with selection, price, and the products the customer needs – and make a small profit. If the past few weeks since its opening are anything to base its success on, the company has found a winning formula – and managed to still have fun in the process. To learn more about Jiggy’s, and see the some of the amazing glassware and funny bundles of products, visit their website (www.jiggyspipes.com), or contact Mark Jiggy at 720-244-6075, or by email at bigjig@jiggyspipes.com. Original Keywords: Mark Jiggy, MMJ community, glass pipes, hookahs, bongs, zongs, Jiggys Pipes, Medical Marijuana Dispensary, specialty glassware, Colorado business, glassblowers, Denver Jiggy’s Pipes Denver Colorado DENVER, Colo.
REFERENCES: Business News, Mark Jiggy, MMJ community, glass pipes, hookahs, bongs, zongs, Jiggys Pipes, Medical Marijuana Dispensary, specialty glassware, Colorado business, glassblowers, Denver Jiggy's Pipes Denver Colorado DENVER, Colo.